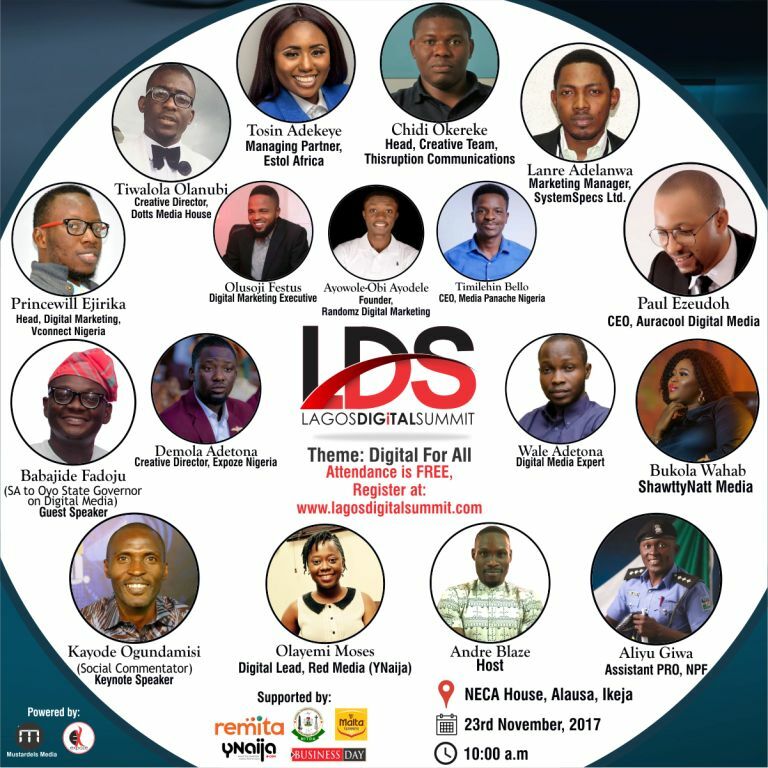 LAGOS, Nigeria, 24th October 2017: To help individuals and businesses harness the constant innovations in a fast-paced digital world, Mustardels Media, a frontline digital media outfit, is convening the Lagos Digital Summit (LDS) 2017, a gathering of digital communication eggheads, professionals and enthusiasts for the advancement of society and the enrichment of Nigeria’s burgeoning population. Organised in collaboration with Expoze Nigeria, a leading Lagos-based digital media firm, the summit will hold on 23rd November 2017 at NECA House, Alausa, Ikeja and will focus on how digital media can be better leveraged for growth as a person or as a small or large organisation. Other speakers and panelists at the conference would include digital marketing specialist Demola Adetona; serial digital media entrepreneur Ezeudo Obinna a.k.a TweetOracle; OAP Adekeye Tosin; Timilehin Bello, CEO, Media Panache; Tiwalola Olanubi, Creative Director, Dotts Media House; Ayowole Obi-Ayowole, Creative Director, Randomz Digital; and Bukola Wahab, Lead Strategist, ShawttyNatt Media. Expected at the event are Social Media Enthusiasts, Techprenuers, Start-ups, MDAs, FinTechs, other corporate bodies and the general public. Entry is FREE but registration online at www.lagosdigitalsummit.com before the event is required for attendance.